Wage Calculator Excel 20 is accounting & finance software developed by Bizpep. Define roster schedules and automatically calculate associated wage costs for staff, Area, and Department by day and week. A base wage and up to six additional wage loadings are definable while Department, Area and staff can be configured to suit almost any business strucure and size. Wage classifications, and staff can be freely added with two staff work periods per day to accommodate split shifts. Standard Excel print functions are available. This program is shareware, which means you can download and use Wage Calculator Excel 20 for free during 30-days trial period. After this period you gonna have to buy Wage Calculator Excel 20 software for $57.00 or uninstall the program. 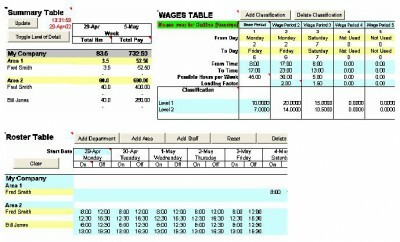 Wage Calculator Excel 20 supports English interface languages and works with Windows 98/XP/Vista. Latest Wage Calculator Excel 20 does not contain any spyware and/or advertise modules, allowing installing it with no worries concerning valuable information loss. Our website has thoroughly tested business product Wage Calculator Excel 20, written the review and uploaded installation file (204K) to our fast server. Downloading Wage Calculator Excel 20 will take several seconds if you use fast ADSL connection. Grand Staff - For pianists, singers, and budding musicans.